This week, three quarterbacks have top-five positional salaries on DraftKings and FanDuel. Roethlisberger was subpar at home in Week 4 against the Ravens, completing only 57.5% of his passes for 274 yards and a touchdown with an interception. But we can perhaps overlook that game. The Ravens have the second-highest coverage grade (86.7) from Pro Football Focus (PFF), and divisional games are usually tough. Big Ben should be much better this week. 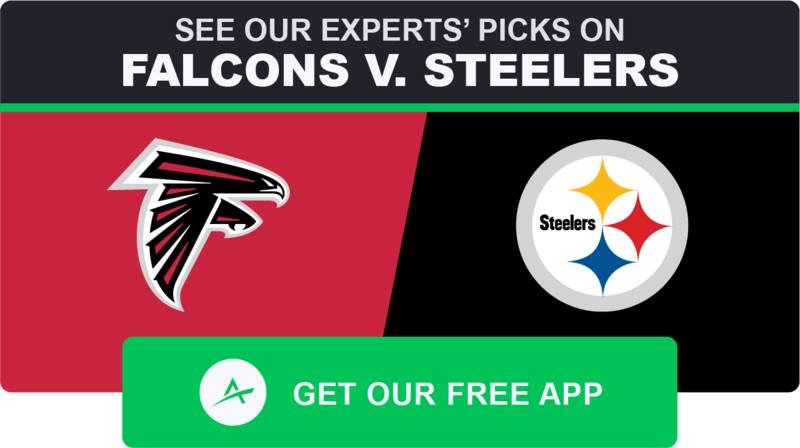 Roethlisberger has a great matchup against the Falcons, who are 28th in pass defense with a 22.2% mark in Football Outsiders’ DVOA and have allowed quarterbacks to score the league’s fourth-most DraftKings points per game (28.5). The Falcons defense has suffered a rash of injuries to open the year: Starting middle linebacker Deion Jones (foot, IR), free safety Keanu Neal (knee, IR), strong safety Ricardo Allen (Achilles, IR) and defensive tackle Grady Jarrett (ankle) are all out. This will be the team’s first game without Jarrett, and last week was the team’s first without Allen. But in the Falcons’ three full games without Jones and Neal, they’ve been handily exposed by quarterbacks. Of any quarterback to play at least 16 games since 2014 — the year Big Ben began his current four-season streak of Pro Bowl selections — Roethlisberger has been the league’s best home quarterback. His per-game home/away splits are the stuff of daydreams and nightmares. He’s a below-average quarterback away from Heinz Field, but at home Roethlisberger has a +7.11 Plus/Minus that puts other passers to shame. As if that’s not enough, the Steelers have a slate-high implied Vegas total of 30 points. The last time that Ben was in a spot this good — at home in a Week 2 matchup with a high total against a poor pass defense — he scored a slate-high 42.0 DraftKings points against the Chiefs. 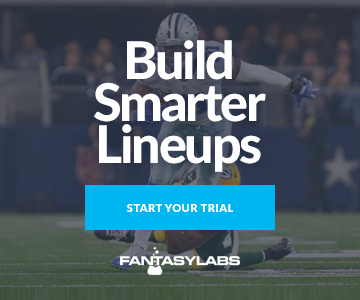 If you roster Roethlisberger in guaranteed prize pools, you might want to use our Lineup Builder to stack him with running back James Conner. Roethlisberger will likely have a high ownership rate this week, but stacking him with Conner could be a sharp way to get differentiated exposure to the Steelers. Conner was off the main slate in Weeks 3-4, but Roethlisberger and Conner were together in just 0.83% of Millionaire Maker lineups in Week 1. Since 2014, Heinz Field has been a points-friendly venue in Roethlisberger’s starts with an 18-10 over/under record, which is good for a 24.5% return on investment for over bettors (per Bet Labs). Not once in that span has the Heinz over had a losing season. Roethlisberger leads all quarterbacks with his median and ceiling projections on DraftKings, where he has a position-high nine Pro Trends and is the highest-rated passer in the CSURAM99, Koerner, SportsGeek and Freedman Models. For good measure, SportsGeek and I also have Roethlisberger as the No. 1 passer in our FanDuel Models. On Sunday morning, I will probably look for action on Roethlisberger’s yardage prop. To find the best bets in the props market, use our Player Props Tool, which is powered by our industry-leading projections. Since Week 1, the props with a bet quality of 10 have gone 90-45-3, which is good for a 65% win rate. Even though Ryan looked utterly incompetent in Week 1, completing just 48.8% of his attempts for 251 scoreless yards and an interception, he’s been on fire since, ripping off three straight top-eight performances. Of all the quarterbacks on the slate, Ryan has been the best this season with his 29.2 DraftKings points per game and +12.09 Plus/Minus. After suffering through offensive coordinator Steve Sarkisian’s growing pains in 2017, when the Falcons ranked just 23rd with a 50.0% red-zone conversion rate, Ryan & Co. have come alive since Week 2. Here’s a log of their 13 red-zone trips over the last three weeks. With a 13-for-13 record in the red zone since Week 2, the Falcons are now seventh in the league with a 66.7% conversion rate for the season. Ryan is likely to regress at some point, but his 6.9% touchdown rate might actually be sustainable: It’s actually below the 7.1% rate he put up in his 2016 MVP season. Although he still hasn’t been able to get a touchdown to All-Pro wide receiver Julio Jones, Ryan has been aggressive in targeting his No. 1 option. Jones leads the league with 502 yards receiving and 713 air yards, and he’s also first in the NFL with a 0.32 market share of targets and 0.51 market share of air yards. That downfield assertiveness has benefited Ryan, who leads all quarterbacks with 447 deep-passing yards and trails only Chiefs quarterback Patrick Mahomes with his 12 completions of 20+ yards. Ryan’s past three games have all been at home, so it makes sense to question whether Ryan will be as productive on the road. But in the Jones era (since 2011), Ryan has been a splits-agnostic passer. Additionally, since last season (including playoffs), the Steelers defense has been significantly worse without Pro Bowl inside linebacker Ryan Shazier. This season, the Steelers are allowing a slate-high 31.1 DraftKings points per game to quarterbacks. It’s hard to say that Ryan is any less of an option than Roethlisberger. 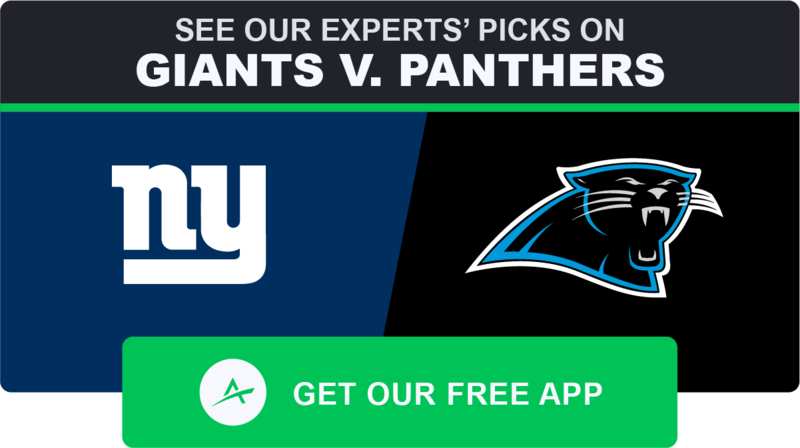 Returning from the bye week as a big home favorite, Newton should be rested and ready to exploit a Giants defense ranked 28th with a 12.7% DVOA. While there were concerns to open the season about how well offensive coordinator Norv Turner would be able to adapt his Air Coryell system to Newton, the 2015 MVP is having another big season. He’s played just three games, so the sample is small, but he presently has a career-high 67.4% completion rate, 9.3 carries per game, a career-low 1.1% interception rate and a 5.9% sack rate. In his five healthy seasons, Newton has been a top-four fantasy quarterback, and he’s looking to accomplish that feat again with his average of 26.5 DraftKings points per game. Unsurprisingly, a large portion of Newton’s value comes from his rushing production. On a per-game basis, he leads all quarterbacks with 6.5 expected fantasy points and 4.1 points better than expectation as a runner (per the RotoViz Screener). First on the team with three rushing touchdowns and second with 28 carries and 136 yards rushing, Newton is basically his own short-yardage back — though that isn’t surprising: He’s first among all quarterbacks in league history with 57 rushing touchdowns and second to only Michael Vick with 39.8 yards rushing per game. He’s viable in almost any game environment because of his running ability. What’s perhaps most amazing about Newton’s recent performance is how he’s been able to overcome the roster issues around him. Continuity is crucial along the offensive line, and three of last season’s starters are not on the field: Left tackle Matt Kalil (knee, IR) and right tackle Daryl Williams (knee, IR) are both out, and 2017 All-Pro left guard Andrew Norwell is now on the Jaguars. On top of that, Newton is without longtime tight end and No. 1 receiver Greg Olsen (foot), who has been out since the first half of Week 1. And yet, since last season, Newton on a per-game basis has actually been more productive without Olsen than with him. Regardless of his circumstances, Newton produces. And while he certainly is viable on his own in tournaments, he’s also stackable with teammates: Newton has above-average correlation with both running back Christian McCaffrey and wide receiver Devin Funchess. Newton has the highest median projection on FanDuel, where he’s the top-rated quarterback in the Bales Model. He’s also the No. 1 option for Bales and CSURAM88 in their DraftKings Models. Besides Roethlisberger and Newton, there are four quarterbacks atop the individual Pro Models that Jonathan Bales, Peter Jennings (CSURAM88), Adam Levitan, Sean Koerner, Chris Raybon, Kevin McClelland (SportsGeek) and I have constructed. UPDATE (10/6): Wide receiver Randall Cobb (hamstring) is out. Rodgers sustained a first-half knee injury in the season opener, and although he was inspiring in his halftime return and classic fourth-quarter comeback, he’s clearly been a lesser version of himself since. For reference: From 2014-17, Rodgers averaged 23.0 DraftKings points per game with a +1.28 Plus/Minus. During that time, he averaged 8.1 adjusted yards per attempt (AY/A). Over the last three weeks, that number is 7.0. Granted, he’s had tough matchups against a Vikings defense that has limited him under head coach Mike Zimmer (-2.60 DraftKings Plus/Minus, 14.3% Consistency Rating); a Redskins defense that ranks third with a PFF coverage grade of 83.1; and a Bills defense that ranks eighth with a PFF coverage grade of 75.4. But his matchup this week isn’t especially advantageous, either. Additionally, Rodgers is on the wrong side of his home/away splits, which are exacerbated by his favorite/underdog splits. As a road favorite, Rodgers has averaged just 20.5 DraftKings points across 19 games with a -1.49 Plus/Minus and 31.6% Consistency Rating since 2014. On top of that, wide receivers Randall Cobb (hamstring) and Geronimo Allison (concussion) are both questionable to play. It wouldn’t be surprising if both missed Week 5. Even so, Rodgers has usually been productive even when hampered, and as has been the case the past few weeks, he’s likely to have an almost nonexistent ownership rate. Rodgers is always capable of a big performance — he has eight games of three-plus touchdowns over his past 16 starts — so he warrants consideration as a Shibboleth-esque contrarian play. Rodgers has a position-high ceiling projection on FanDuel and is the top-rated DraftKings quarterback in the Koerner Model. UPDATE (10/6): Wide receiver Marvin Jones (ankle) is questionable. Although Stafford missed more than half of his first two seasons to injury and was plagued by inconsistency early in his career, since 2011 he’s been a locked-in, stats-chasing, gunslinging, yardage accumulator: Over the last 7+ years, only Saints quarterback Drew Brees has more than Stafford’s 33,149 yards passing. And Stafford has been especially sharp since 2014, when wide receiver Golden Tate and offensive coordinator (then quarterbacks coach) Jim Bob Cooter joined the team. And keep in mind that Stafford’s recent production has come despite not having game-changing wide receiver Calvin Johnson since 2016. But that’s not to say that Stafford doesn’t have talented pass catchers. Outside of the Rams and Bucs, the Lions have the league’s best trio of wide receivers in Tate, Marvin Jones and Kenny Golladay, who match up well against the Packers secondary. Plus Green Bay could be without No. 2 cornerback Kevin King (groin), who has missed the past two games. Tate has run 73.0% of his routes out of the slot this year, and with the Lions he’s averaged 93 receptions and 1,056 yards receiving per season. He’s a shifty technician and after-the-catch master facing a talented-but-raw rookie in slot corner Jaire Alexander. Jones is a speedy, big-play specialist who led the team last year with 1,101 yards and nine touchdowns receiving. We’re expecting his primary defender to be right cornerback Tramon Williams, who has been solid throughout his career but is 35 years old and simply doesn’t have the speed (4.59-second 40 time) to keep up with Jones (4.46-second 40). And Golladay is likely to run many of his routes against rookie second rounder Josh Jackson, who is talented but right now has a 64.0 PFF coverage grade and lacks the size (6-foot, 196 pounds) to matchup with the emerging Golladay (6-foot-4, 213 pounds). 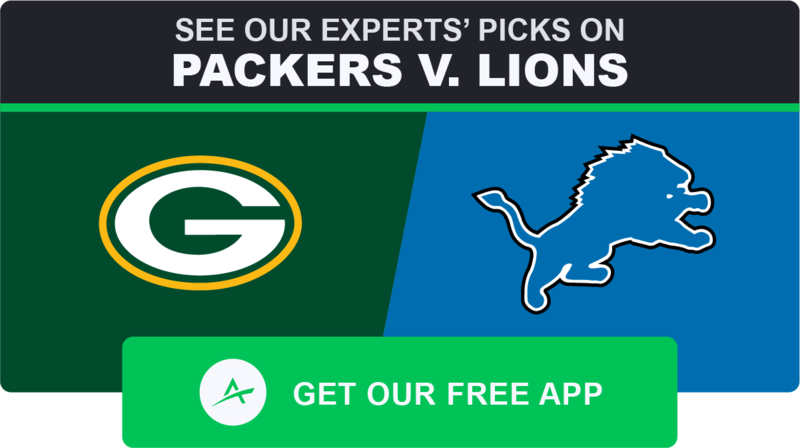 With advantages at each receiver spot, Stafford could have a big day, and in the post-Megatron era, he’s still managed to punish the divisional rival Packers even without a Hall-of-Fame receiver. The Packers have been fortunate to face a few low-upside quarterbacks this season in Mitchell Trubisky (Week 1), Alex Smith (Week 3) and Josh Allen (Week 4), but in Week 2, they were thoroughly exposed by Kirk Cousins (37.5 DraftKings points, 425 yards and four touchdowns passing). At home, Stafford has the potential for a big game. Stafford is the highest-rated DraftKings quarterback in the Levitan Model. Oh, baby. As we highlighted on the Wednesday edition of The Action Network NFL Podcast, this could be a Bortles week. It’s true that Bortles “leads” the NFL with 67 interceptions since entering the league in 2014. Betting the over on his interception prop every Sunday morning is one of the purest pleasures in life. And it’s also true that the Jags last season had a league-low 50.5% pass rate and that Bortles has a backup-caliber 59.5% career completion rate. Even so, among players with at least 16 starts since 2015, Bortles is the No. 10 fantasy quarterback with 17.6 fantasy points per game. Last season, in a run-focused offense, Bortles still managed to have seven games with either 300+ yards passing or multiple touchdowns. And this week the Jags might actually skew toward the passing game. 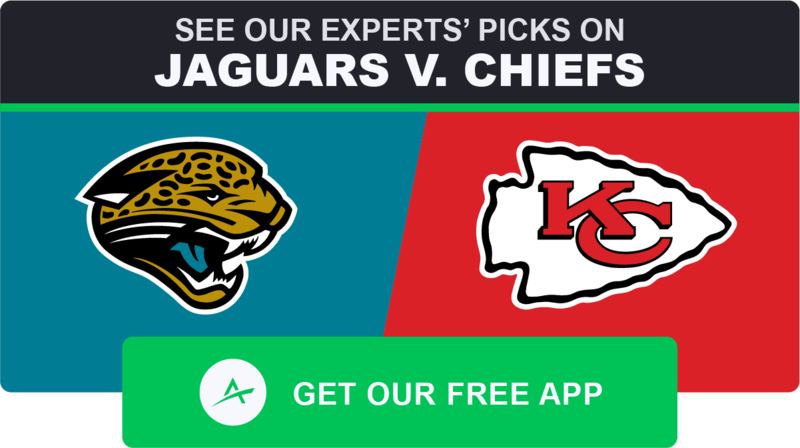 Against the high-flying Chiefs (league-high 36.3 points per game), the Jags will probably need to put up points to stay competitive, and against quarterbacks not named Case Keenum, the Chiefs have been exploited. Through four weeks, the Chiefs have a PFF-worst 41.3 coverage grade, and All-Pro strong safety Eric Berry (heel) is still yet to play. Without him, the Chiefs have not one defensive back or linebacker with a PFF coverage grade of even 67. On top of that, the Jags will be without running back Leonard Fournette (hamstring), who has been the engine to the team’s running game. In his absence, Bortles has been a much more productive player since last season on a per-game basis. Bortles is a subpar passer, but he is surrounded by a wealth of athletic high-upside receiving talent in wide receivers Keelan Cole, Dede Westbrook, Donte Moncrief and D.J. Chark, pass-catching backs T.J. Yeldon and Corey Grant, and tight end Austin Seferian-Jenkins. In this matchup, Bortles could crush. He’s the No. 1 FanDuel passer in the Levitan and Raybon Models. Last season, Wilson led all quarterbacks to play a full season with 23.2 DraftKings points per game, but this year DangeRuss has disappointed. After an acceptable Week 1 performance in Denver (298 yards, three touchdowns passing and two interceptions), Wilson has been a diminished version of himself. This week, though, with the high-scoring Rams in town, Wilson could have a pass-heavy game script that essentially forces him to put up fantasy points. Although the Rams have an imposing defense led by a feared front three of interior linemen Aaron Donald, Ndamukong Suh and Michael Brockers, they don’t have a strong exterior pass rush. And their secondary has taken a hit with recent injuries to Marcus Peters (calf, questionable) and Aqib Talib (ankle, IR). In Week 4, with a limited Peters and without Talib, the Rams had a low 53.2 PFF coverage grade, allowing the Vikings to hit 31 points and Cousins to score 35.7 DraftKings points on 422 yards and three touchdowns passing. With the recent return of No. 1 wide receiver Doug Baldwin, it’s possible that Wilson could have success against the Rams, especially if he unlocks his Konami Code upside: Wilson is second only to Newton with 495 carries and 2,828 yards rushing since 2013. In an all-important #RevengeGame for OC Brian Schottenheimer (read: self-aware irony), Wilson could have a vintage, 12th man-aided “this is still my NFC West” performance. Wilson is the No. 1 DraftKings quarterback in the Raybon Model. Here’s a quick look at the remaining starters on the slate. While the Chargers have a limited home-field advantage at the 25,300-seat StubHub Center, they have been favored there nine times. In those games, Rivers has averaged 23.2 DraftKings points with a +5.14 Plus/Minus and 88.9% Consistency Rating. Ignoring last season’s irrelevant Week 17 but including the playoffs, the Rams have hit their implied Vegas totals in 15-of-20 games under head coach and beard model Sean McVay. The Rams are entrenched as the No. 1 team in The Action Network NFL Power Rankings, and Goff has 300-yard, multi-touchdown games in 6-of-12 regular-season starts since last season’s Week 8 bye. UPDATE (10/6): Wide receiver Sammy Watkins (hamstring) is questionable. Mahomes is the No. 1 fantasy quarterback with 31.1 DraftKings points per game and a +12.59 Plus/Minus. He’s yet to score fewer than 25 DraftKings points in a 2018 start, and the Chiefs have crushed their implied Vegas totals this year by 10.06 points per game. Priced way down on DraftKings, where the Jags have held quarterbacks to a league-low average of just 11.6 points, Mahomes has a position-high 99% Bargain Rating. If he can smash in this spot, his salary will reach unprecedented levels as the season progresses. Mariota (elbow) can’t fully grip a football right now, but he is coming off a 344-yard, two-touchdown game; has a position-high 72% FanDuel Bargain Rating; and leads all quarterbacks with a 97% DraftKings leverage score. Cousins has a proud underdog history of trouncing NFC East opponents in general — 22.7 DraftKings points per game, +5.07 Plus/Minus and 80% Consistency Rating — and the Eagles in particular (23.3, +5.88, 80%). Other than the erstwhile FitzMagic, Cousins is the only quarterback this year with multiple 400-yard, three-touchdown passing performances. UPDATE (10/6): Wide receiver John Ross (groin) and running back Giovani Bernard (knee) are out. The Bengals have hit their implied Vegas total in every game this year (+8.88), and Dalton has done the same with his salary-based expectations (+7.31 DraftKings Plus/Minus). Since 2014, Dalton has been at his best as a favorite outside of Cincinnati (72.7% DraftKings Consistency Rating). UPDATE (10/6): Pass-catching running back Darren Sproles (hamstring) is out. Two games into his return from a season-ending double-ligament knee injury, Wentz has been a functional-but-lesser version of his MVP-caliber self, averaging just 19.0 DraftKings points per game this season. On the plus side, he should have a low ownership rate (2.2% in Weeks 3 and 4), and the Vikings have been surprisingly poor this year in pass defense, ranking 28th with a 54.3 PFF coverage grade. With the Vikings last season, Keenum had 17.15 DraftKings points per game with a +1.46 Plus/Minus. In all his other starts since 2014, he’s averaged 12.7 DraftKings points with a -2.45 Plus/Minus. It’s almost as if … he’s not a good quarterback. Regression will come for Flacco at some point, but right now he’s pacing for a career-best 5,008 yards and 32 touchdowns passing with a personal-high 7.7 average yards per attempt thanks to new wide receivers John Brown, Michael Crabtree and Willie Snead. The Ravens have hit their implied Vegas totals in every game this season. I’m bullish on the No. 1 overall pick, but the Ravens have the league’s second-highest PFF coverage grade (86.7) through four weeks — and now they’re getting back No. 1 cornerback Jimmy Smith (suspension). On top of that, wide receivers Jarvis Landry (knee) and Antonio Callaway (knee) both missed practice on Wednesday. Carr leads the league with seven interceptions — but he also has a career-high 1,373 yards passing and 71.0% completion rate in the opening month of the season. Oakland’s implied Vegas total has moved a slate-high 1.75 points since lines opened, as the spread has moved toward the Raiders and the over/under has jumped up two points. Tanny has a career-best 69.1% completion rate and 8.4 AY/A, but he was exposed in Week 4 and has league-low 94 pass attempts among all quarterbacks to start four games this season. The future third-ballot Hall-of-Famer still hasn’t led the Giants to 30+ points since Week 17 of the 2015 season, and he’s yet to hit 300 yards passing in any game this year. UPDATE (10/6): Wide receiver Marquise Goodwin (hamstring/quad) is a game-time decision. For the first time in his professional career, the raw 2017 third-round pick is a favorite. What could possibly go wrong? Although the Cardinals are 0-4, they have held quarterbacks to the league’s fourth-fewest DraftKings points per game (14.6). The freewheeling Jake Locker impersonator has an NFL-worst 53.4% completion rate among current starters. But, honestly, who could’ve expected that a guy with a 54.2% completion rate in college might struggle in the NFL? The raw numbers from Rosen’s first start don’t look great: 55.6% completion rate, 180 yards and one touchdown passing. But he did have a passing grade of 89.9 against the Seahawks. The 49ers have allowed 25.0 DraftKings points per game this year to quarterbacks and on defense could be without starting left cornerback Richard Sherman (calf, doubtful), strong safety Jaquiski Tartt (shoulder, questionable) and free safety Adrian Colbert (hip, questionable). The Hair heavily relies on slot receiver Quincy Enunwa (37 targets), but this week Enunwa has a tough matchup against cornerback Chris Harris Jr., the league’s preeminent slot defender. 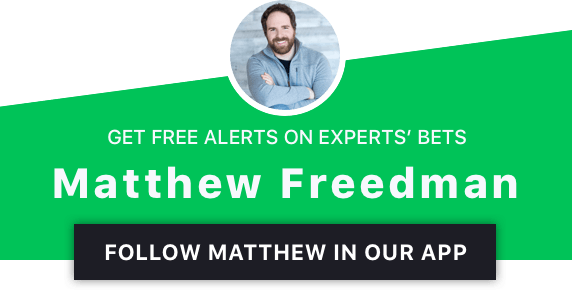 The Jets are favored now, but as Chad Millman and Bob Scucci discuss on the Wednesday edition of The Favorites podcast, by game time the Broncos will probably be favored.